“This workshop has set us up for success. Thank you for the wealth of information—the pathway to success! "Lunches and dinner were really nice, thoughtful, and appreciated by all participants - makes you feel you like you have new friends you can reach out to rather than just instructors and classmates." "This was an excellent course and tied M&A integration concepts together well. Instructors had great experience and perspectives. The caliber of participants was impressive. 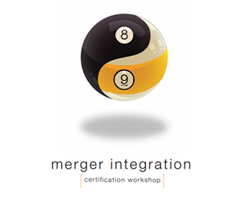 The course will help us fast track our merger integration." — Barb Gray, Senior VP - Human Resources, PowerStream, Inc.
"A very good workshop to improve our PMI approach with best practices and other participants’ approaches. "Very enjoyable learning experience, and the right balance of learning breaks and fun. You did a nice job of creating a team environment with all of us feeling comfortable. Good discussion plus relevant and great expertise from the presenters." "Great structure, and professional, experienced trainers for each topic, and a perfect location and environment. PRITCHETT has a great consulting style." "Really great mix of process and people focus. Effective teaching through experienced trainers–they kept it real and relatable. Useful for both large and small companies." "A lot of good information. Case study was relevant and provided a vehicle for good open dialogue." "Great course. Very eye opening in many areas we have normally overlooked. Dynamic class taught by experienced hands-on people." "Great level of detail and level of engagement. Very relevant to my role and needs." "Instructors were very well prepared and insightful. I feel much better about the daunting tasks that are just ahead!!" "The program was very practical and I will be able to implement tools and lessons right away." "There were aha moments that were sprinkled throughout creating immense value for future deals." "Keen insights and learning into the nuts and bolts of integration!" "I believe the knowledge gained from this course will help us get the best value out of our acquisitions going forward." 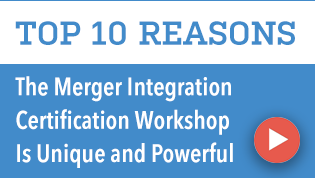 “Having been involved in multiple integrations in the past this helped me put all the pieces together.